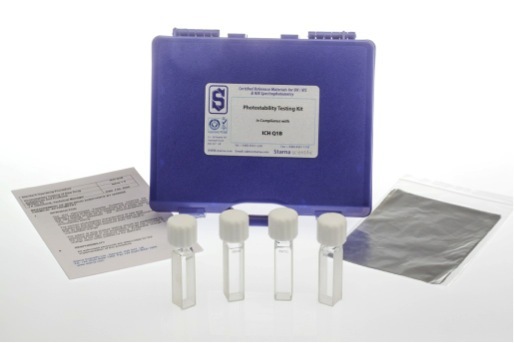 This kit has been designed to assist compliance with the requirement for drug photostability testing imposed by the International Conference of Harmonisation’s Q1B stability testing guidelines. In 1996, the ICH (International Conference On Harmonisation) issued its Q1B guideline stating that thephotostability characteristics of new drug substances and products should be evaluated to demonstrate that exposure to light does not result in unacceptable change. The substance under test is exposed to ultra-violet light under controlled conditions, using quinine as an actinometry standard, exposed under the same conditions. 1. Sample – Test cuvette, to be filled with sample under evaluation for exposure to radiation. 2. Control – Test cuvette, to be filled with sample under evaluation, and then wrapped in aluminium foil to protect completely from light, and used as the control. 3. Q Sam. – Calibration cuvette, to be filled with Quinine solution for exposure to radiation. 4. Q Ref. – Reference cuvette, to be filled with Quinine solution, and then wrapped in aluminium foil to protect completely from light, and used as the reference. Full instructions for use are provided with each kit.